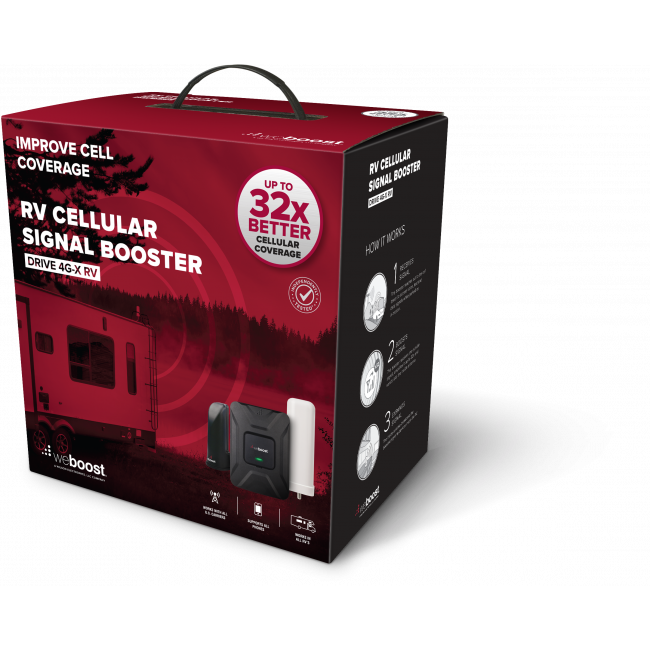 The weBoost 470410 Drive 4G-X RV Signal Booster Kit is a great option for boosting cell signal in your RV or large vehicle. 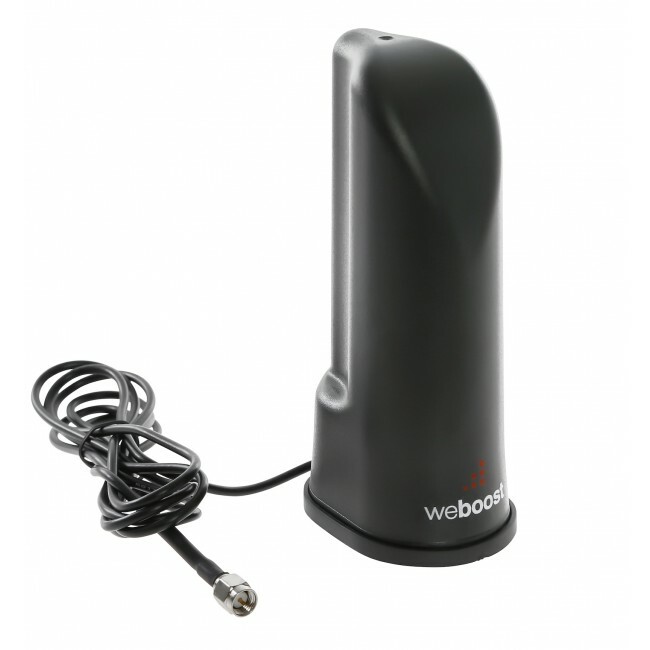 It features the weBoost Drive 4G-X amplifier, which has the maximum uplink and downlink power allowed by the FCC, that allows you to be as far as possible from cell towers and still have a usable signal, along with a high powered omni outside antenna, to receive cell signal in 360 degrees while moving or stopped. 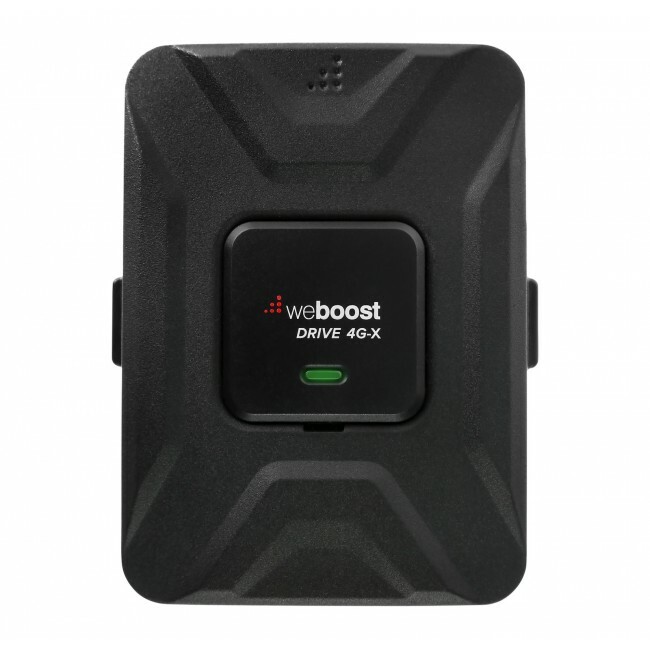 Why the weBoost 470410 Drive 4G-X RV Kit? 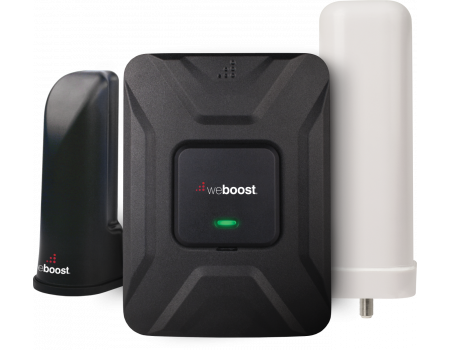 The weBoost 470410 Drive 4G-X RV Signal Booster Kit is a great solution for anyone who has an RV or large vehicle and needs the best coverage inside while moving or stopped. 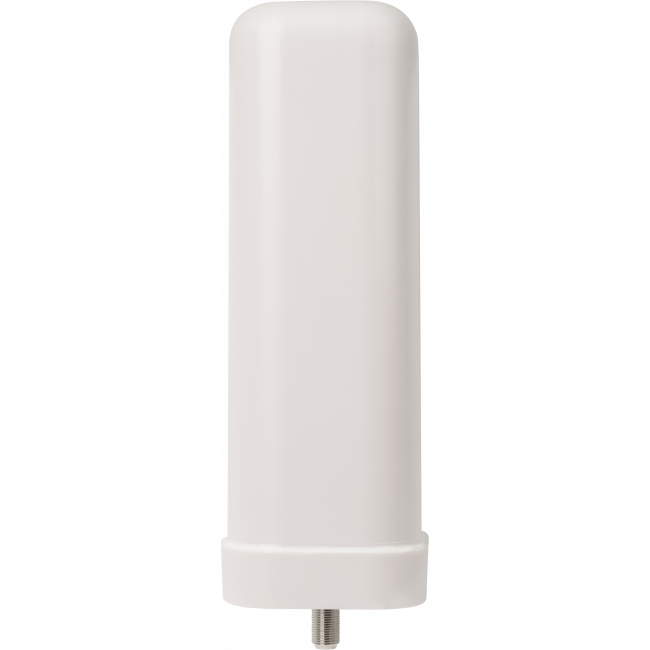 Please note: The outside omni antenna is not spring mounted, so this is a great kit for anyone who has a shorter RV and is not worried about breaking off a permanent mount antenna on the top of their RV or large vehicle. 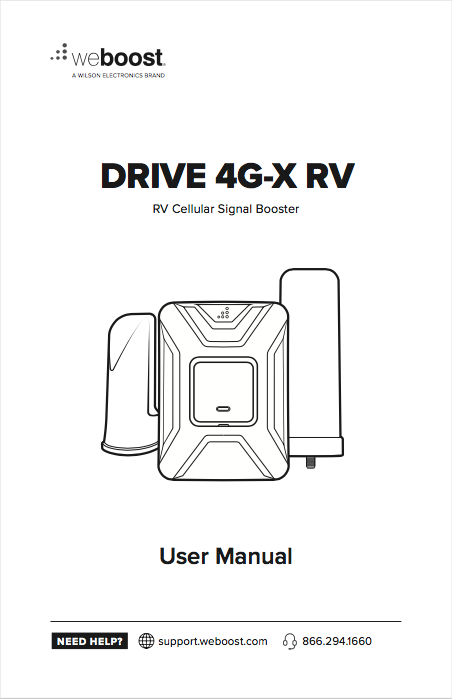 The weBoost 470410 Drive 4G-X RV Signal Booster Kit works by mounting the included omni outside antenna as high up on the RV as possible, in a location to receive and send signal in 360 degrees. 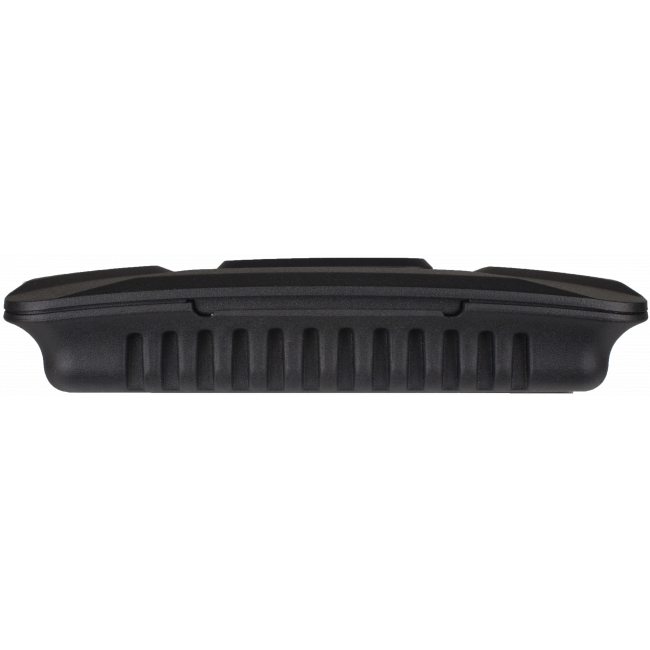 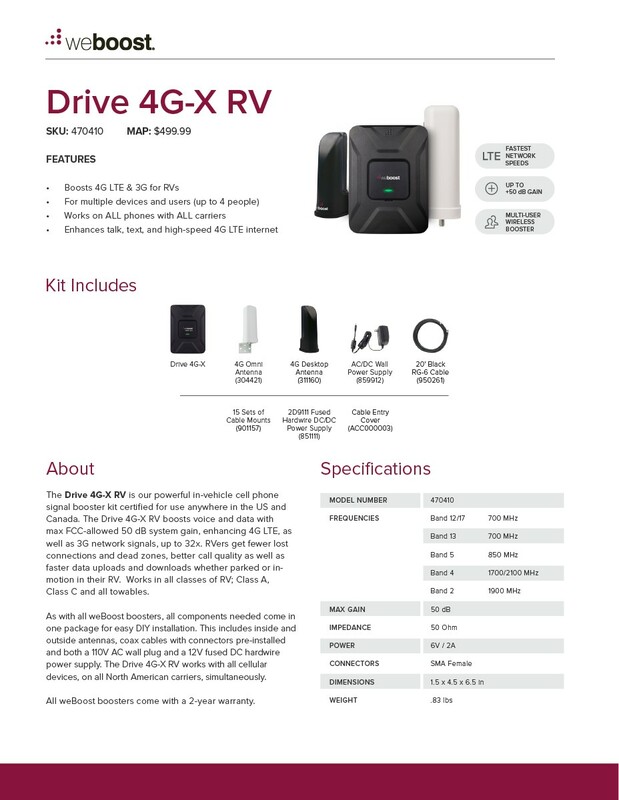 The antenna then receives the outside cell signal and passes it over a cable to the Drive 4G-X signal amplifier located inside of the vehicle. 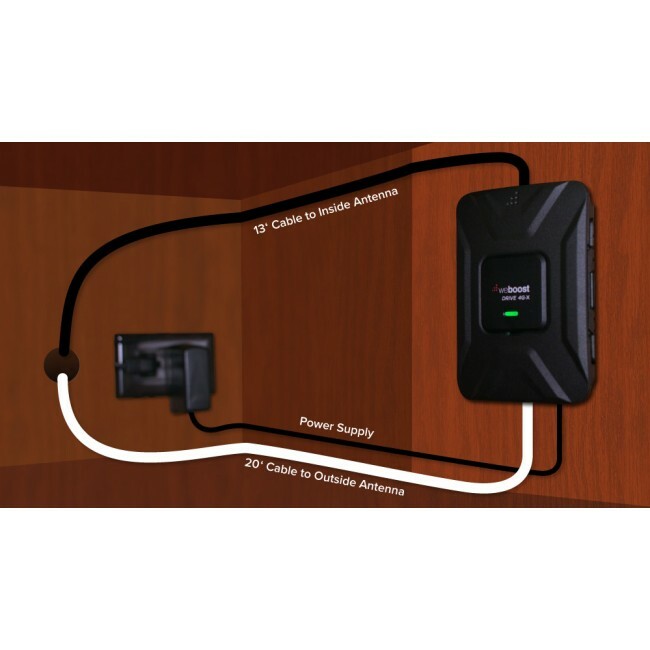 The amplifier boosts the cell signal, and then sends it over another cable to the included desktop inside antenna, which broadcasts the boosted signal to the area of the RV that needs better signal. 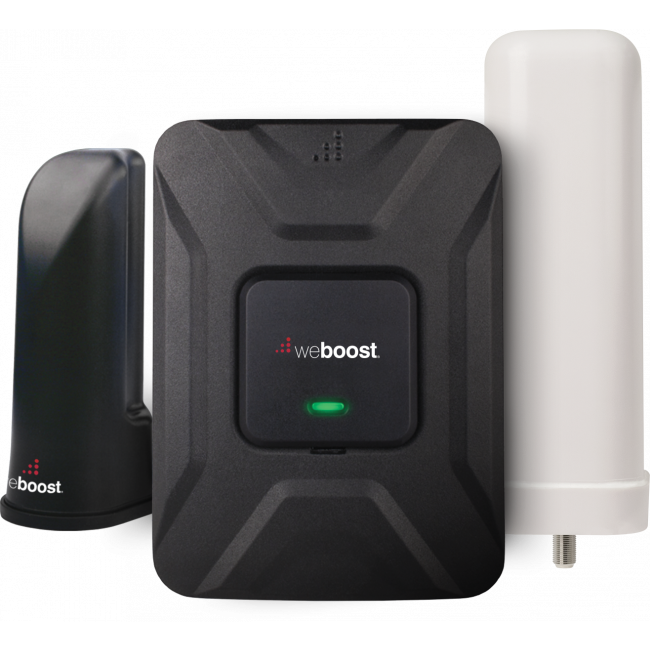 The weBoost Drive 4G-X RV kit has been designed to work with all cell phones and all carriers in the United States, Canada and Mexico, as well as carriers from some other countries in Latin America, South America and Australia. 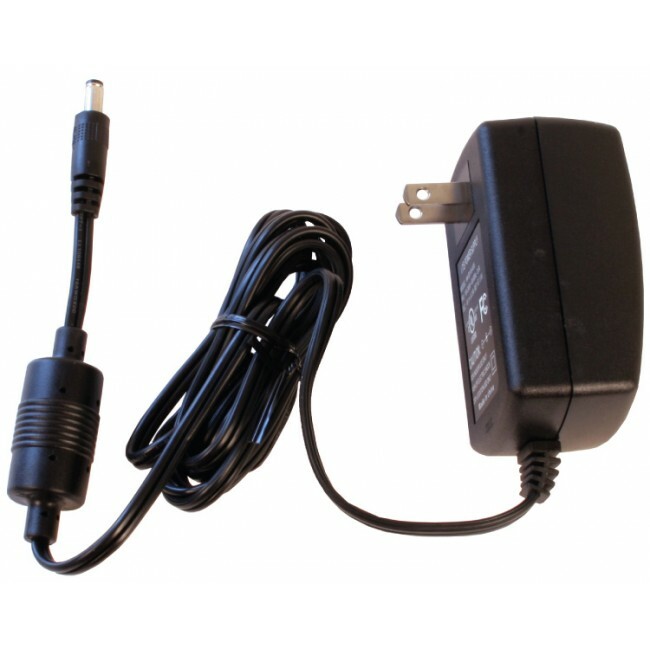 In addition, the kit includes 15 sets of cable mounts, a hardwire DC power supply, and a cable entry cover. 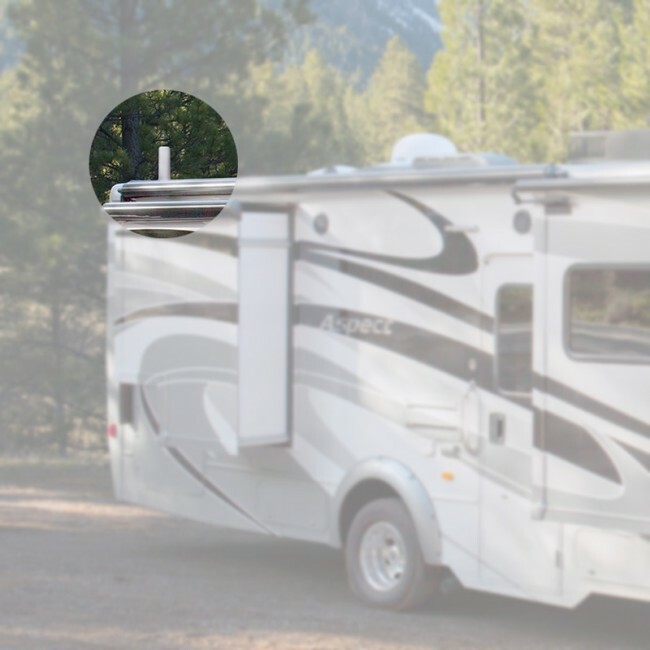 To start, mount the omni antenna on the roof of the RV, ideally towards the back and in a location where the antenna has a 360 degree view. 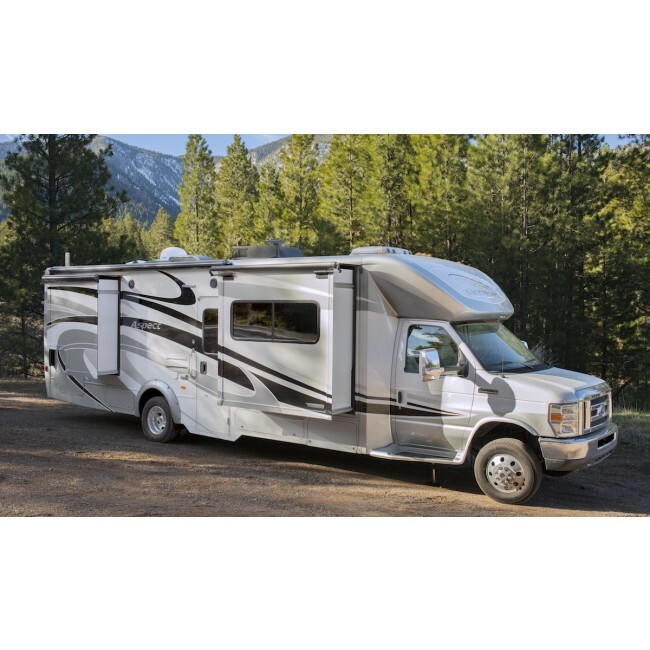 Attach the black 20 ft cable and run into the RV to the location where you plan to mount the amplifier. 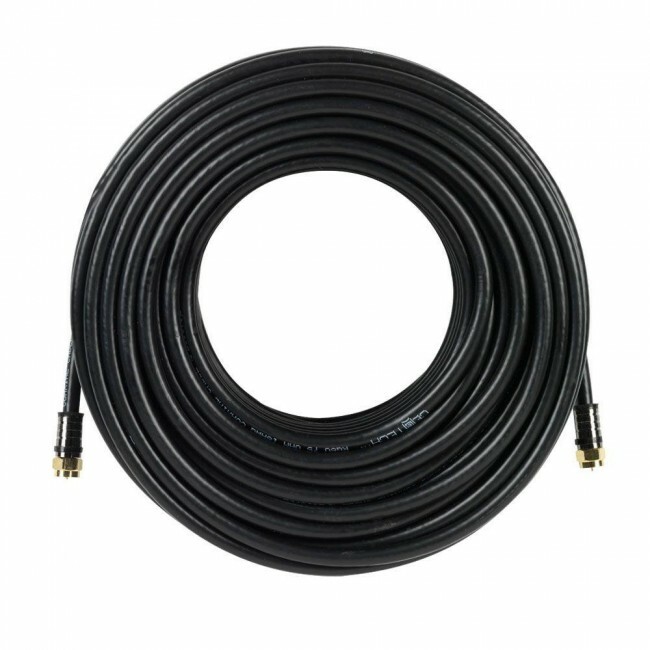 Connect the cable to the external antenna port on the amplifier, then connect the cable from the desktop antenna to the internal antenna port. Position the desktop antenna in the location where you need the best signal, then connect the power supply to the amplifier and power on the unit. 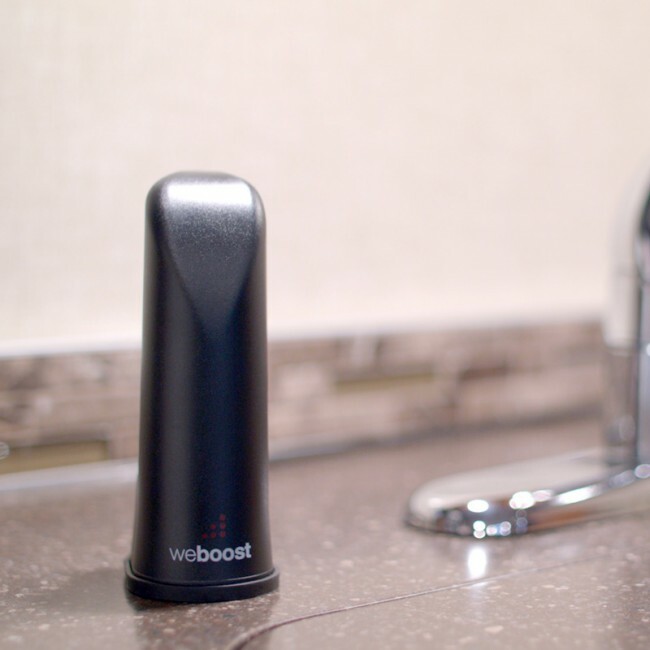 The system should automatically start boosting signal.